Reddit's official Ask Me Anything, or AMA, application has just been dropped onto the Google Play Store a few days after the iPhone and iPad release. The AMA joins a collection of similar Reddit apps that allow you to browse subreddits from the comfort of your Android smartphone or tablet. However, what sets aside the official Ask Me Anything application from the competition is that it is specifically designed for the AMA sessions. The application will also notify you of updates to trending AMAs so you're able to stop by the thread before they end. If you're a fan of Ask Me Anything, you're likely going to love the new official app! Let me recap about the Reddit wesbite. This is a combination of an entertainment, social networking and news website where users, known as redditors, can submit content, including text and links, which are then voted on by other users. Items can be voted up or down and are categorised into subreddits. One example is the Entertainment category, which has Creepy, Documentaries, Gaming, Movies, Sports, Videos and Trees. Redditors can earn link karma points if they contribute a popular thread. There are dozens of subreddits and several communities generate thousands of comments a day. Ask Me Anythings have become popular in recent years after their introduction in 2009. They're best considered as something akin to an online press conference. Having an official Ask Me Anything app available on the Android platform is sure to boost popularity (and it has been a long time coming!). Over the years, Reddit have seen many big names participating such as President Barack Obama (during the 2012 campaign), Madonna, Larry King and David Copperfield. Barack Obama's AMA at the end of August 2012 caused part of the Reddit website to fail, such was the volume of interest. I'm chomping at the bit to try it out. Do you use Reddit? 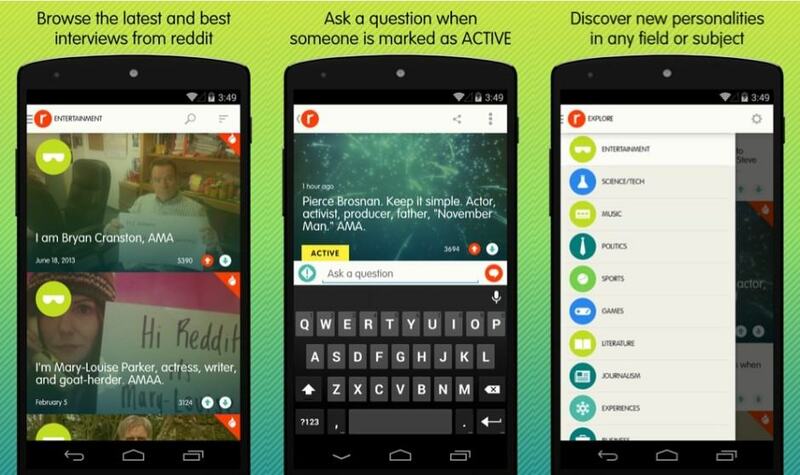 Have you tried any of the alternative Reddit apps available from the Google Play Store? If so, why not try the new official app and let us know how it compares in the comments below, or hit us up on one of our social media websites?